Being the proactive, finger-on-the-pulse Recruitment Consultants that we are, we’re very happy to announce the birth of our new baby: the Financial Staffing Solutions Recruitment App! This App can be downloaded onto your iPhone, Tablet or Android phone. 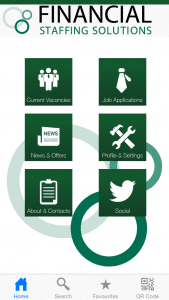 It’s packed with our latest jobs which you can apply for via the App. Latest market news and salary surveys and our must read blog. All of which you will be able to access anywhere you have an internet connection on your device. The App is completely free, download it and you can start look for new career opportunities. The Financial Staffing Solutions app makes it easier for you to find your next accountancy or finance position. Developed especially for mobile or tablet platforms our “job push” function allows you to apply to a vacancy as soon as it goes live. Financial Staffing Solutions is a leading finance & accountancy recruitment agency covering positions throughout London and the South East. Our app will forward our latest jobs, give you the opportunity to upload your CV, track your application and get advice via our blog, tips and salary surveys all by the tap of a finger. Specialising in Accountancy and Finance roles ranging from bookkeepers to qualified Finance Directors, we take pride in treating each applicant as an individual. Supporting the talented and ambitious with introductions to the very best career opportunities, as well as providing guidance and support throughout the selection process. We are always pleased to hear from people who looking for a new career opportunity.